Bill Gates has a long history. I remember reading a biography of him when I was a teenager. At that point Gates was both respected and hated. Microsoft had an iron fist on much of the software market in so many ways and used its weight to crush opposition. Since then Gates seems to be a different man – a much more caring and philanthropic man. It may have been an article in Newsweek I read a few years back that talked about Melinda Gates (Bill’s wife) and the significant influence she has had upon him positively in these regards. Whatever the reasoning, I have a lot of respect for what Gates is doing these days in a variety of fields – not the least of which is battling disease. As part of this battle Gates has launched a “Mosquito Week” on his blog to go alongside the well-known “Shark Week” that debuts each year on television (and which I never watch) in an attempt to raise awareness of the threat mosquitoes pose. He includes a fascinating infographic which I’ve embedded below. HT to Andrew Vogel for posting it via Facebook and thus bringing it to my attention. 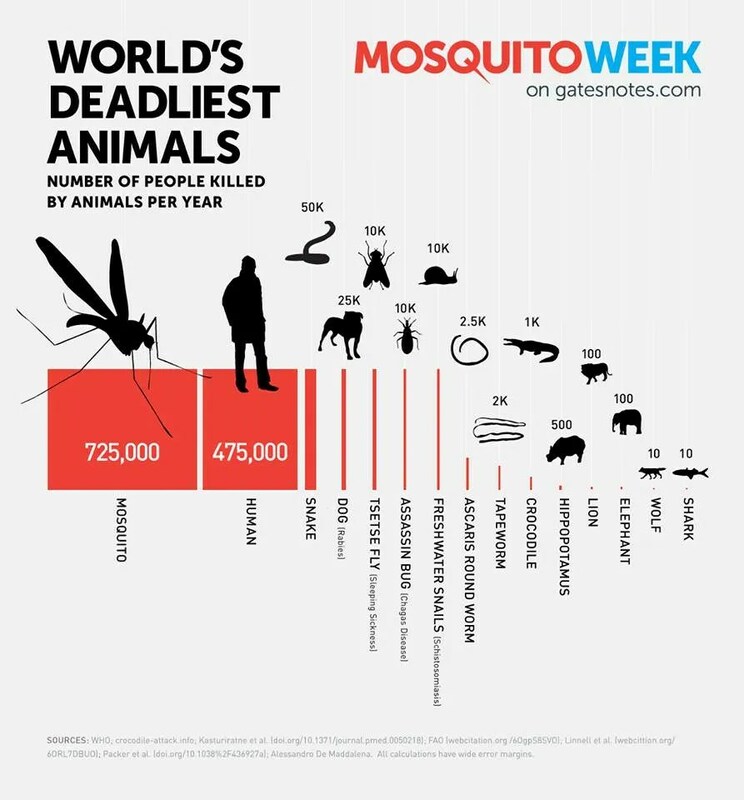 An infographic from Bill Gates on the deadliest animals in the world. Next story Disarming My Smartphone. Previous story I Want More Sugar?